Beautiful, large (1238 square feet) comfortable and quiet apartment in one of the historic buildings available for holiday rental all year round. Right in the heart of St Germain des Près where stars and artists can be seen drinking coffee at the café de Flore or La Palette, the apartment is located minutes from the Pont des Arts, the musée d'Orsay and the Louvre, the flat is ideally situated to explore Paris and enjoy its night life. The street is packed with Art Galleries, lovely cafés and an open air market just a few minutes up the road. The building itself dates back to 17th century, hence the exposed beams and the open fire place. If you are after the historic Paris you will not be disappointed. The flat is very light and spacious with a wealth of accessories: Cable TV and ultra fast Internet connection, WIFI and the bonus of FREE telephone calls. Our Property Manager is reachable 24/7 by phone and his assistant will be happy to help you with basic concierge services like restaurant suggestions, planning a day trip outside Paris, organising a babysitter for an evening and so much more. Parking being one of the hardest thing in the area, our covered car parking space can also be used. SORRY NO YOUNG CHILDREN. Listed Building: The flat is located on the 3rd floor (American 4th) of a lovely 17th century listed building. Georges Sand (Chopin's love) lived there. 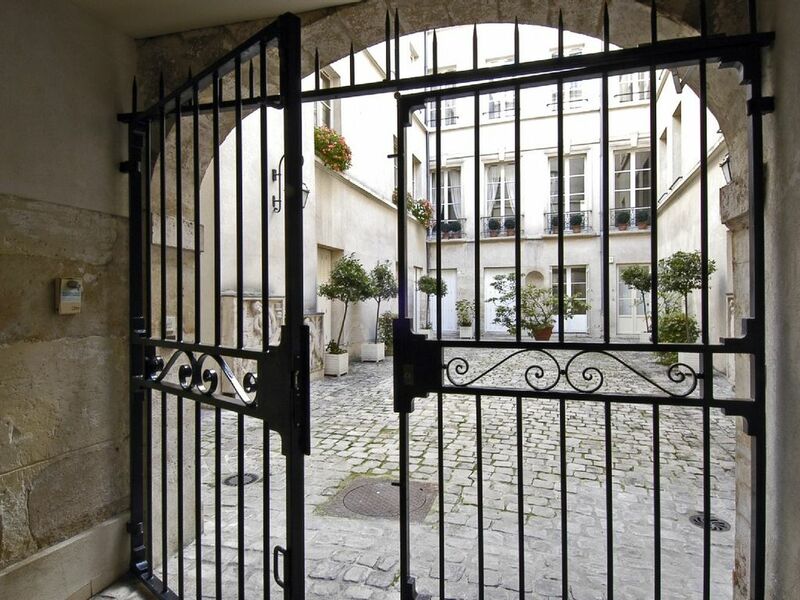 It is accessed via a beautiful secluded courtyard and a lift. Although the area is very lively, the flat itself is very quiet. Because the flat is on the third floor with 7 windows in the main living area, it is very light and feels very spacious. The area: Rue de Seine is packed with amazing art galleries, little cafes such as La Palette or Le bar du Marché as well as interesting little shops. It is both convenient to visit all the most famous Paris sites as well as enjoy its night life . Only minutes from the Louvre (just need to cross the Pont des Arts), the Musée d'Orsay and Notre Dame. You will be able to enjoy sitting at the Terrace of the Café de Flore or the Deux Magots and watch Parisian life go by. If you like going to markets, Rue de Seine has a little one which offers delicious fruit and veg and many deli produce. Going out in the evening will be so easy, between Conran's L'Alcazar and other buzzing restaurants, the choice is yours but one of our favourites is Fish. Be sure however to book it in advance. 1)Unique property. 3) Very spacious and light. 2) Located in one of the best areas of Paris. 3) Beautiful Courtyard. 4) Concierge Service. 5) Manager on call 24/7. Note that Joseph, our Property Manager, is reachable 24/7. We also offer a concierge service to help guests with their daily needs & information they require. Suzan, his assistant, will be happy to help you with basic concierge services like restaurant suggestions, planning a day trip outside Paris, organising a babysitter for an evening and so much more. Bathrooms have loads of cupboard space. Luxury towels and bathrobes are also provided. Each bathroom has a hairdryer. Portable units in all the rooms. We would prefer if this was not used because of the pollution it creates. Parking restricted. Note: we have our own covered parking space in a building around the corner. WARNING: It is not adapted for large SUVs. We have our own covered parking space nearby. For up to 4 slices. Various types of tea, coffee, salt, pepper, olive oil, balsamic vinegar as well as spices and other bits and pieces left. all we ask is if you use something such as dry pasta or rice, please replace. Newly fitted kitchen with granite working surface and splash backs. The kitchen is very well equipped and you find everything you need to cook to a high standard. The property has a number of steps to access bathrooms and loos and for this reason, makes the property impossible for wheelchair access. A welcome hamper is provided on arrival. Please also note that you will find a Nespresso machine as well as a normal coffee machine. The kitchen is very well equipped with tons of plates, glasses and cutlery so you don't have to worry about it. Please note that there are a number of steps (for the bathrooms and toilets) within the flat which makes it difficult for elderly or disabled. The flat is not really suitable for very young children. Children 8 and over welcome. All calls are free. Our family of five enjoyed this apartment, which is in a great location for prime sites (walking distance) and a wonderful neighborhood of residences, boutiques, galleries, and places for specialty foods and dining. The apartment was as described, with the added benefits of responsive and helpful hosts and manager--thank you again, Patricia and Joseph! They put us in touch with a car service that satisfied our transport needs, again, with the added benefits of responsiveness and reliability. We look forward to future stays here! Great location, great staff, best mattress in Europe! We loved our stay. The location is fantastic and within walking distance to many of the city sites. Also, the location in St. Germain is close to many great restaurants, brasseries,art galleries and shopping. The apartment was perfect for our family of 5. A small bed was provided off the living area for our 5th child. Well stocked kitchen and communication was great. We would definitely book again. Awesome location. Nice apartment. Good size for a family of 5. Overall a great experience. We were in Paris during the tail end of a heat wave and the air conditioning fell behind in the main area of the apartment. It kept up fine in the two bedrooms. Small local grocer with the necessities right across the way. Restaurants everywhere! We loved this location the heart of St. Germain walking distance to most everything! The apartment had all we needed for 9 day stay. The owners provided portable AC units for us as Paris was in a heat wave during our visit which was really important for our family:) We would stay here again! Perfect apartment for Mom's with daughters. Safe and quiet. Patricia, thank you so much for your prompt replies to my last minute correspondences. Your apartment was perfect for a Mom and daughter traveling to Paris who was worried about everything (safety, foreign language issues etc). Also, your quick refund of my security deposit means you are the real deal and honest. We will be back as I already talked my husband into joining us on the next trip. Sincerely, thank you and Joseph! Right in the centre of Paris St Germain des Prés. Minutes from all the historical sites incl. Le Louvre, Les Invalides, Notre Dame and of course the Eiffel Tower. Perfect for visiting and enjoying either a romantic dinner or a vibrant night life. 750 pounds security deposit will be requested on arrival. Deposit will be refunded once phone expenditure has been calculated and checking out has been completed. 50% deposit requested to secure booking . Balance payable one month prior arrival. If booking made within a month of arrival then full payment required. The rest of the year, bookings have to be made for a min. of 3 nights.